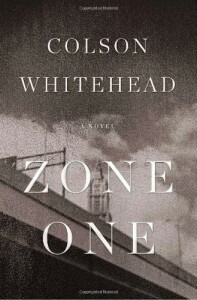 My 2012 reading schedule has gotten off to a good start with Colson Whitehead’s Zone One. I’ve managed to avoid the zombie genre (with the honorable exception of Night of the Living Trekkies, which is – of course - Star Trek) but ever since reading The Intuitionist, I’ve been a fan of Whitehead’s, and was more than willing to see what his take on it would be. It is, in a word, bleak. Whitehead doesn’t go into the origins of the zombie apocalypse nor does he offer any scenes of derring-do as heroic survivors fight off hordes of brain-munching zombies. What we have instead is a world of shell-shocked survivors (pheenies) who have been chivied into refugee camps and enlisted in Project Phoenix (queue “Stop! Can You Hear the Eagle Roar? (Theme from Reconstruction)), the reconstituted government in Buffalo’s attempt to restore matters to the status quo ante-apocalypse. The narrator is Mark Spitz*, as he describes himself, a mediocre “average Joe,” who has managed to survive and now operates as a sweeper in Zone One. The Zone, formerly Manhattan, is the government’s showcase project – the elimination of the island’s zombie population as prelude to recolonization. Sweeper teams (Mark’s includes himself; Kaitlyn, the squad leader; and Gary) move through the deserted city taking care of the remaining skels and stragglers. ** Usually it’s a routine job. The sweepers wear the latest in anti-zombie armor, and as long as they don’t get careless, can handle matters. He dropped his new rifle and picked up his old one. It had gotten him through the Zone. It would get him out of it. Why they’d tried to fix this island in the first place, he did not see now. Best to let the broken glass be broken glass, let it splinter into smaller pieces and dust and scatter. Let the cracks between things widen until they are no longer cracks but the new places for things. That was where they were now. The world wasn’t ending: it had ended and now they were in the new place. They could not recognize it because they had never seen it before…. I wasn’t turned off by the coldness of the writing – Mark Spitz is nearly affectless in his reactions to events – since it was part of the world Whitehead was creating. In fact, I found myself identifying very closely with the narrator and didn’t find the story dragged at all. And despite the tale’s emotional distance, I still found a number of characters to care about – Kaitlyn, Gary, the Lieutenant, the brief glimpses of how other survivors cope. In this latter category, the most memorable character for me is Mim, a woman Mark Spitz comes across in a toy store one day and with whom he shares a few days together before she disappears on a foraging expedition. In the end, I would recommend the book. * “Mark Spitz” is not the real name of the book’s narrator but an ironic nickname that he picked up when he refused to jump into a river to escape a group of ravenous zombies (he can’t swim) and wound up gunning them all down (an ironic homage to the typical Rambo-esque slaughter scenario). In that vein, Whitehead has a little fun with satirizing many of the zombie genre’s tropes, including – in my favorite example – when the resident religious fanatic opens the gates to the zombies because they’re part of God’s latest punishment on His people. ** “Skels” are the regular zombies – shambling, decaying wrecks with a taste for living brains. “Stragglers” don’t wander and generally don’t pose a physical threat. They’re dead who have found a location that meant something in their past and now molder there: A janitor who endlessly mops the same spot; a copy boy who stands forever before his Xerox machine; or a goth Gypsy fortune teller eternally poised over her Tarot cards.